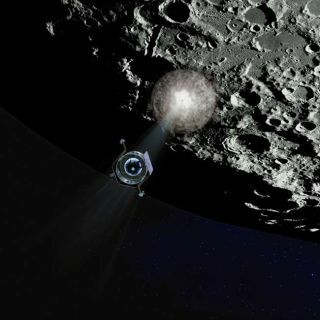 An artist's interpretation of NASA's LCROSS spacecraft observing the first impact of its rocket booster's upper stage before heading in for its' own crash into the Moon's South Pole. Get ready for a uniquecosmic collision! Early this coming Friday morning (Oct. 9), NASA's LunarCrater Observation and Sensing Satellite (LCROSS) will end its mission with abang ? literally.? Currently carrying with itthe upper stage of the rocket that launched it on its way to the moon on June18, the game plan is to send that spent rocket motor on a course to smashinto the lunar surface. ? But just not anywhere onthe lunar surface, but to a thoroughly scrutinized crater called Cabeus thatlies near the moon's south pole and is enveloped in perpetual darkness. Thehoped-for resultant effects will be to find hidden water ice frozen inside thecrater.? And for seasoned skywatchershere on Earth, it should also produce a visible cloud of ejected material.However, only knowledgeable amateur astronomers with the right equipment willbe a able to detect the event. Others can watch the event live on NASA TV. The general belief among astronomers is that over the lastfew billion years, the moon has been bombarded by countless numbers of comets.The water from most of these comets completely sublimated away but if anysettled at the bottom of a crater near the moon's poles, these permanentlyshadowed regions can keep the water from disappearing, remainingas ice for a very long time.??? Cabeus is a relatively flat crater about 60 miles indiameter on the moon's south pole that scientists believe may be one of thosespecial cases that might hold water ice in its perpetually shadowed top soil. NASAinitially selecteda different target for LCROSS, the nearby crater of Cabeus A, but switchedto the larger Cabeus because data suggested it had a higher likelihood ofcontaining hidden water ice. The impact is scheduled to occur this Friday, Oct. 9 at 11:30UT. That's 7:30 a.m. EDT; 4:30 a.m. PDT. To convertUniversal Time to your local time, go here. Impact will happen less than 10 hours after the spent LCROSSCentaur rocket motor is released and its Shepherding Spacecraft maneuvers intoposition to trail the Centaur en route to the lunar surface. The 5,000-poundCentaur, is expected to slam into Cabeus at a sharp angle at a speed of 5,600mph (9,010 kph). If all goes according to schedule, the Shepherding vehicle,carrying nine science payloads, will follow the Centaur's plunge into the moon,beaming back data live to the Earth. Like a bullet hitting sand, the Centaur'sexplosive collision is expected to create a crater roughly 60 or 70 feet wideand perhaps as much as 16 feet deep, in the process dredging up approximately 385tons of lunar dust and soil ? enough to fill nearly 18 school buses. Inaddition to recording the collision, the Shepherding Satellite will fly throughthe regolith plume thrown up by the collision, just before it too slams intothe lunar surface some four minutes later, kicking up its own smaller plume ofdebris. But before it's sacrificed in the cause of science, the1,500-pound Shepherding Spacecraft will utilize its specialized sensors andwill look for water's telltale chemical signature within the larger debrisplume created by the Centaur, possibly in the form of ice, hydrocarbons orhydrated materials.? NASA wants the amateur astronomer community to join in a"citizen scientist" program. Jennifer Heldmann heads the LCROSSobserving campaign. "We would like to have as many eyes and instrumentswatching the impact as possible because this is the way we'll get the most dataand the most information as possible." Those who live to the west of Mississippi River will havethe best opportunity because the sky will still be dark. Those living east ofthe Mississippi will still have the moon in the sky, but either dawn twilightor ? in the case of those living along the Atlantic Seaboard ? sunrise willhave occurred, making for a much brighter sky background. A dark backdrop willbe an important prerequisite, since it's estimated that when the debris plumeforms on it will be no brighter than a sixth-magnitude star (the threshold ofnaked-eye visibility), and quite likely even fainter.? If you want to attempt to see the impact yourself, here are someimportant points to be aware of:? First, you're going to need a moderately large telescope,somewhere on the order of at least 10 to 12 inches of aperture. Smallertelescopes will probably not be able to do the job and you will definitely notsee anything using binoculars. You'll likely need to use magnifications in the250 to 500-power range to have a legitimate chance of getting a glimpse of thedim impact plume.? Keep in mind that high power dilutes the brightness of animage, as well as aggravates any unsteadiness of detail. As a general rule ofthumb that the maximum amount of magnification for any telescope is 50-powerper inch of aperture.? ?But wait a minute,? you may protest, ?my telescope comeswith a special Barlow lens, that the manufacturer promises will double or eventriple the magnification of my eyepiece." True enough. In fact, that aforementioned 500-power islikely achieved by pushing the scope?s highest power eyepiece with that verysame Barlow lens, which ultimately will result in a dim, impossibly fuzzyimage. If you?re a beginner, you need to understand that that using a Barlowlens is similar to enlarging a photograph. The negative ? like a telescope?simage ? contains only so much detail, which can be blown up only so far beforeall you can see is fuzz!? So, if you have a 3-inch department store telescope ?even if it is blessed with perfect optics ? the claim of 500-power is more thanthree times the limit of the most practical magnification that it canprovide. The impact will take place at the lunar south pole, or onthe lower limb of the moon along the dark portion immediately adjacent to theterminator (the line that separates the illuminatedday side and the dark night side of the Moon). Try to keep the very brightsunlit portion of the moon out of the field of view as much as possible. The plume is expected to be in the shape of a "V"but it will be exceedingly small in size relative to the moon itself. Accordingto NASA's Brian H. Day, the dusty material is only expected to rise about 6miles (10 km) above the lunar surface. From Earth, that would be equal to aboutone-quarter of 1 percent of the moon's apparent size or about 5.2 arc seconds. To try and get an idea of just how large this is, point yourtelescope toward Jupiter which conveniently shines in the southern part of ourcurrent evening sky. Jupiter's disk currently measures 45-arc seconds indiameter; so the dust plume from LCROSS would appear only about 1/9 as large asthat! And the plume ? if and when it's visible ? will not lastvery long. The best guesstimates are that it will last no more than 2 minutes. You can get more detailed viewing tips from NASA here. Observatories expected to participate in the study includethe newly refurbished Hubble Space Telescope, Hawaii's Keck and Geminitelescopes, the Magdelena Ridge and Apache Ridge observatories in New Mexico, the MMT Observatory in Arizona and the Lunar Reconnaissance Orbiter (LRO) nowcircling the moon. Lastly, you can watch the event live here on NASA TV, beginningat 6:30 a.m. EDT/3:30 a.m. PDT.? POLL: Just How Important is Water on the Moon?